There’s never been a better time to make new musicals. Eighteen years ago, Theatre Royal Stratford East was the only producing theatre in the country putting together regular programmes to encourage new musical writers. My predecessor, Philip Hedley, knew that one way to bring in new audiences was to develop musicals using contemporary music by non traditional storytellers. We now have Broadway megahit Hamilton coming our way with the hype and buzz it deserves. Not only is it a diverse company with a modern sound, but it pushes the form and attracts a young, diverse audience. Alongside this American import we, in this country, have a plethora of theatres and production companies talking publicly about the importance of musical theatre. 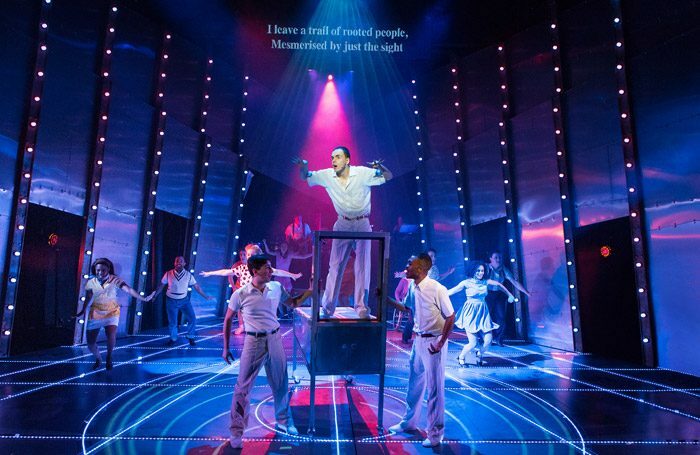 Alongside Stratford East’s ambitions, Curve in Leicester and the Other Palace in London are also declaring themselves as champions of new musicals. Perfect Pitch, Mercury Musical Developments and Musical Theatre Network, among others, are also working hard to develop new talent, as are independent producers such as Katie Lipson and the Stable. Even the National Theatre has a ‘secret’ group of non musical theatre writing talent working on new musicals. When it came to working on The Who’s Tommy, there were several things that needed to happen: problems to fix, ambitions to fulfil. It’s a great score with thumping rock energy and some beautifully detailed lyrics. In pre production, we met with Pete Townshend, who wrote the bulk of the original material. He was open and generous to our ideas and wrote us a new song so Peter Straker, our Acid Queen, had more of a story arc. We also charted all the major remounts, from the first performance in the 1970s at the Queen’s Theatre, Hornchurch, to the two West End outings, Broadway and the famous Ken Russell film. There was plenty of raw material for dramaturg Paul Sirett and musical director Robert Hyman to work from. There was even a bluegrass version. The show was made by a consortium of six producing theatres under the umbrella name Ramps on the Moon: the New Wolsey, lead producer for this production, with Birmingham Rep, Nottingham Playhouse, West Yorkshire Playhouse, Sheffield Theatres, Stratford East and the pioneering Graeae Theatre Company. We had to make sense of the story for the here and now, particularly in terms of the social and political landscape and how D/deaf and disabled people are portrayed. But this project was about the mainstream changing itself from within, making its own mistakes and having the confidence to make work in which disabled and non disabled artists take charge alongside one another. The ambition for Ramps on the Moon is not only to put lots of D/deaf and disabled artists on stage, but also to be part of the creative team and in as many technical departments as possible. So we worked hard to understand the period and attitudes to people with impairments, how they were medically assessed and treated, how some would see disabled people as ‘special’ and inspirational (‘how amazing that they can do that’), or ‘damaged’ and needing salvation. We cast 22 actors who could act, sing, dance, play instruments and were familiar with British Sign Language. We weren’t interested in triple threats. We needed at least quadruple threats, and many in the company can do all five of those skills – quintuple threats. Half of the company would define themselves as disabled. When we cast William Grint as Tommy and Donna Mullings as his mother (both are D/deaf), we unlocked the show. How we chose to hear and see and communicate was interrogated, both within the story and between the performer and audience. The most famous lyric – and, for some, the most problematic – was also the key to understanding our version of the show. Another Ramps on the Moon ambition: every performance had to be accessible with audio description, captioning and BSL creatively integrated into the show where possible. Two creative consultants, Jeni Draper and Daryl Jackson, worked with us to find the appropriate BSL for the meaning, subtext and period of the words. Mark Smith, our choreographer, of Deaf Men Dancing fame, would take that vocabulary and use it as the root of the movement. Draper and Jackson would also work with some of the actors and new BSL interactions were devised, so those who understood the language would get a bit extra. By solving access issues we found our creative language. How does a D/deaf actor sing? Often they don’t – they sign the song. By pairing up Mullings with Shekinah McFarlane, an impressive soul voiced belter, songs began to operate on multiple levels. Between them we could grow the stakes, add subtext and include beautiful juxtaposition. When Mullings smashes Tommy’s mirror to “free him”, Tommy has a huge Townshend rock number. How better to portray that emotional energy than to provide not one but two actors to sing alongside Tommy, who signs the song in BSL. They would sing in musical intervals of fifths and Tommy would sign in a free way – not necessary in spoken English structure since BSL has its own grammar. You would also hear Grint’s natural voice. It was interesting to hear the views of non disabled audiences on a fully accessible experience. The captioning unit above the stage had value for many audience members. One person told me all musicals should have caption machines because “it’s always hard to hear the words”. And it’s true – if I change my Hamilton tickets for the captioned performance, I know the show will be enhanced for me. There’s also a commercial imperative for making every performance accessible or, as we like to call it now, universal: some 20% of our society defines itself as disabled in some way. An inspired producer might take the show into the West End (we’re in discussions). If we pull it off, they’ll be presenting a kind of show yet to be in seen in the West End. By placing diversity and access at the heart of the creative process, we’ve made a little bit of musical theatre history.